Hot dogs are a Georgia staple. You won’t go far without seeing an age-old hot dog joint on the corner or in a close-by strip mall. Georgia hot dog institutions typically serve their dogs “Chicago style,” meaning the dogs are all beef in a steamed poppy seed bun and rimmed with celery salt. For the best hot dogs in Georgia, check out any of the following 10 locations! Jimmie’s Hot Dogs in Albany, Georgia, has been an institution for generations. The cash-only hot dog counter serves juicy dogs for reasonable prices. Many customers have been eating Jimmies for years and years, going as far back as 1959. For many, it’s a must-stop whenever driving near Albany. Choose from a chili dog, chili cheese, chili slaw, chili slaw, or plain with prices starting at just over a buck. Mike’s Hot Dogs has served the fine folks of Sandy Springs since 1996. They serve the more expensive (and tastier) Vienna beef brand of dog, and pair them with Gonella Bread for a true “Chicago style” experience. Each dog is topped with a pickle spear and celery salt. Consider adding chili, slaw, kraut, or grilled onions. If you’re up for a challenge, order The Works. You’ll need a fork to eat it. According to Eater Atlanta, Hot Dog Factory is one of the “12 Essential Hot Dog Spots in Atlanta,” citing their tendency to wrap their dogs in “bacon before adding toppings such as pineapple, guacamole, and chili cheese fries.” The menu includes 18 unique dogs, ranging from the San Francisco Veggie (veggie soy dog topped with onions, tomatoes, lettuce and brown mustard) to the Fire Dog (beef hot dog topped with Arizona heat hot sauce, jalapeno peppers and sport peppers) and everything in-between. Skip’s Hot Dogs has been in business since 1979 serving up “Chicago style” hot dogs. The menu is extensive. What began as a hot dog-only joint has since grown to include Philly cheese steak, Chicago’s pizza puff, and spicy chicken steak, among other items. But the main attraction is still the Vienna sausage hot dogs. Go for the Vienna Chicago-style hot dog, served with choice of mustard, relish, onions, pickles, peppers, tomatoes, and celery salt, and a side of fries. Nu-Way Weiners recently celebrated their 100th anniversary. Since 1916, Nu-Way has served the same style of chili hot dog. With the original neon sign still in operation and the same secret recipe chili, Nu-Way Weiners is set to continue serving for another 100 years. The winner of ample awards, Nu-Way now has 11 locations across Georgia, mostly in Macon. We recommend going for an “All the Way” hot dog. Guido’s Chicago Hot Dogs keeps things basic. 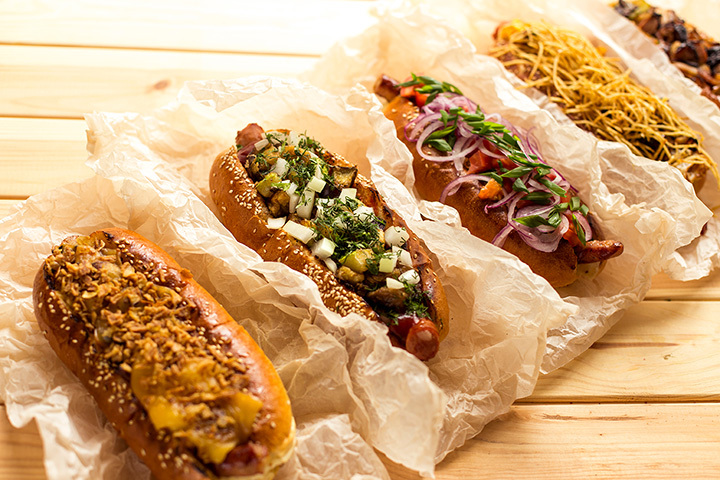 Set in an unassuming strip-mall, these world-class hot dogs are not to be missed. With thirteen different hot dogs on the menu, plus combo options and specialty items, you’ll always have a new flavor to try. Afterwards, get a frozen banana (chocolate covered banana on a stick) for real regional flavors. Dog Days Hot Dogs sells over-stuffed dogs sandwiched between two buns in a colorful, fun setting. Dog Days is Americana at its most authentic, with an eclectic assortment of decorations lining the walls and ceiling. The menu consists of hot dogs, burgers, Philly’s, polish sausage, Italian beef, chili, chicken, Italian sausage, and more. As for the hot dogs, we’d recommend trying the Mac & Cheese dog (homemade mac and cheese with five white cheese) if you’re in for something different, or feel free to build your own dog from any of the toppings on the menu. Mike’s Hot Dogs sells hamburgers, hot dogs, gyros, hamburger steaks and more. The small interior is quirky and colorful. The menu has kid’s options, as well as seven main hot dogs made with 100 percent kosher beef (with the exception of bratwurst and Italian sausage) and three specialty dogs, served on a hoagie roll. Each dog can be topped with mustard, ketchup, and onion. Mike’s keeps things simple, but manages to keep the flavors bold and delicious. Sam’s Hot Dog Stands crop up throughout the South and are known for their incredible chili dogs and milkshakes. The hot dogs are all beef and served with steamed buns. Fresh cut onions and coleslaw are made from scratch daily. This franchise location has been in business since 1986. For a quick bite at a proven restaurant, you won’t do better than Sam’s. The Hot Dog House in Jackson, Georgia, is really the house the hot dog built. The menu includes specialty items like the Chicken Philly, angus burger, and Buffalo wings, but the main attraction is still the hot dogs. Get the combo for a large drink and your choice of French fry or onion rings along with your choice of fourteen dogs. Try the foot-long hot dog, a quarter-pound wiener with three toppings of your choice, or the Scramble Dog (two hot dogs, chopped and covered with chili, mustard, and onions).